This year marks the 70th birthday of Bob Marley, and to celebrate, the Corner Hotel is hosting a night of 100% reggae vibes in honour of the music’s greatest legend. Featuring live reggae bands Ras Jahknow and T-Rhythm, the original “Jamaican connection” Stick Mareebo and Pupa Dalton, Chant Down’s Jesse I and Ras Crucial, plus Zare Demus, DJ Eric, and nuff more. 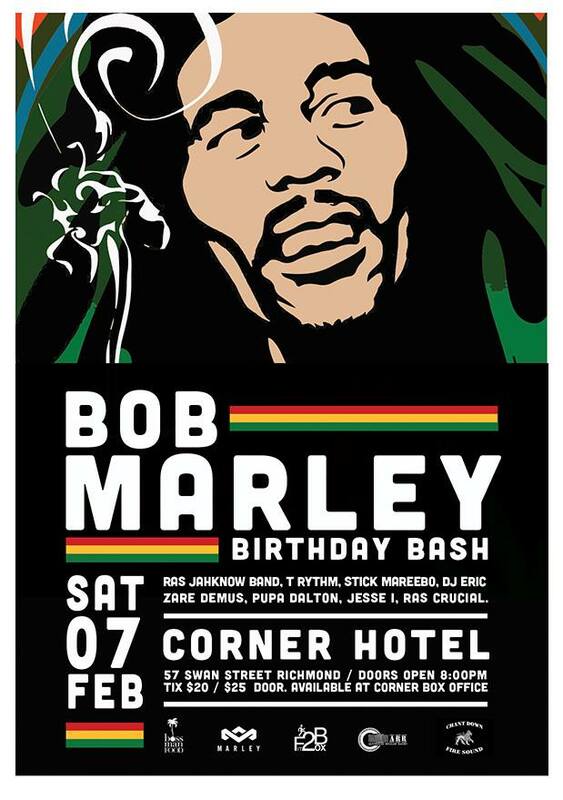 The Bob Marley Birthday Bash 2015 takes place on Saturday 7th February at the Corner Hotel (57 Swan St, Richmond). Pre-sale tickets on sale now from the Corner Hotel on 94279198 for $20, or $25 at the door. Doors open 8.00pm.